Given the success of Purple Haze, the soft wax for dark coloured cars, and Banana Armour, the first hard wax launched by Dodo Juice, it was only natural that a hard wax for dark coloured cars would follow. 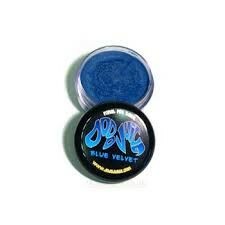 One of our best selling waxes - Blue Velvet - but in a smaller package. Just what the doctor ordered, assuming he was a detailing doctor with a PhD in paint protection. Enough to do three to four coats on a normal sized car, i.e. you may struggle if it's a stretch Hummer or a helicopter that you're planning to tackle. Remember that the Basics of Bling Wax Applicators or Supernatural Finger Mitt foam applicators are perfect for use with these small 30ml jars - they reach places other applicators can't (like the openings of small containers).